Not Currently On View. Seen By Appointment Only. Sargent was the foremost portraitist in London and the United States at the turn of the century, but by 1910 he undertook portraiture only rarely. During the preceding decade watercolor had become an important aspect of his production, and he frequently looked to this medium as a means for personal expression, a respite from the constraints of mural commissions and portrait painting. Muddy Alligators seems to have been such a diversion, painted to offset the frustration of a work in progress: a portrait of John D. Rockefeller at his patron's winter home in Ormond Beach, Florida. 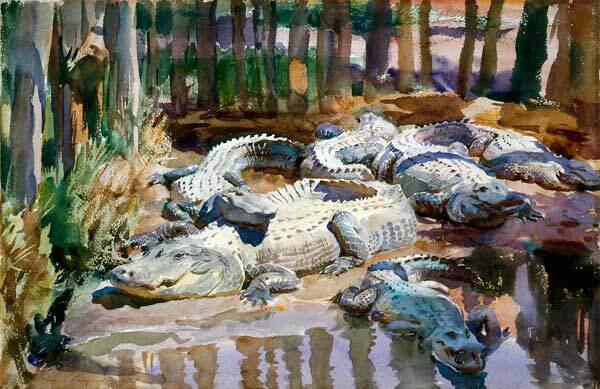 A seemingly unlikely subject for a fashionable painter, alligators caked with mud nevertheless presented a pictorial challenge that recurs in Sargent's oeuvre: the depiction of light and shadow on sun-drenched forms. This writhing, menacing mass of serpentine creatures evoked intriguing possibilities of surface and texture, to which he brought to bear the resources of his bravura technique. A number of preparatory sketches exist for Muddy Alligators: four graphite drawings, all of which the Worcester Art Museum owns, and two watercolors (in the Metropolitan Museum of Art, New York; and the Ormond Family Collection). This finished watercolor reveals a diversity of means: scratching into the paper to denote teeth, applying wax resist to suggest rough textures, and laying on broad brushstrokes to delineate tree trunks.